← Who Needs Stitches When There’s Crazy Glue! 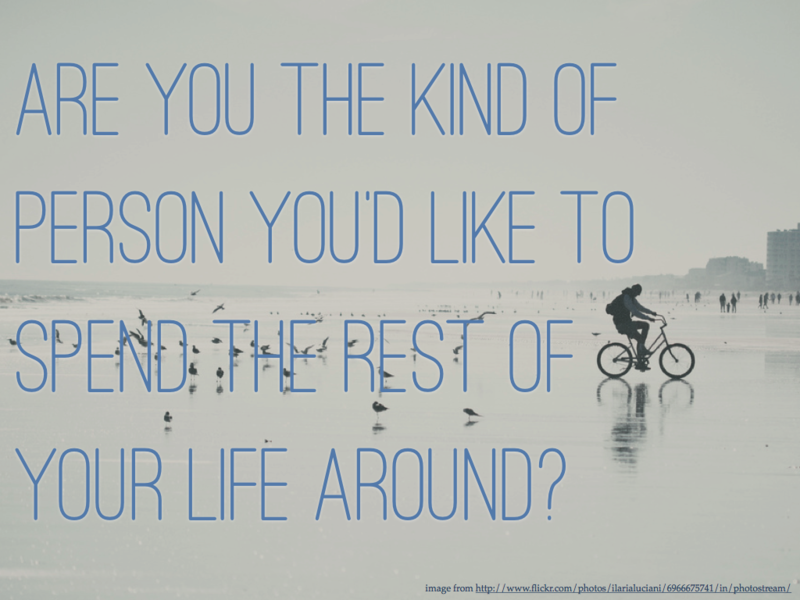 Are You The Kind of Person You’d LIke to Spend the Rest of Your Life Around? Wow. Profound. My first instinctual response was, “Of course!”. I think it would be for most of us, no? But on deeper thought, I think it’s pretty telling. If you already think you’re that person, you’re probably deluding yourself. Is there really nothing in your personality that you’d want to change to be able to spend the rest of your life around? Fundamentally, for me, there isn’t. I am kind, loyal and honest. I will do whatever I can to help someone who needs it, but I won’t necessarily sacrifice my own safety for a stranger. After all, I have a husband and two children to think about. I am a moral individual, I know the difference between right and wrong. I don’t hate. But surely this statement, “Are you the kind of person you’d like to spend the rest of your life around?” is delving deeper, right? I judge. Who doesn’t, right? I am not proud of this. I’m forced to acknowledge this on a daily basis in my job. I can’t judge my patients. It’s not my place. I offer support and empathy, but I never judge. But in my personal life, I see the judgement. I see the woman on the subway standing next to me, all made up perfectly, with the giant diamond on her left ring finger. “High maintenance”, is what I think. I just judged her. I don’t even know her. Some would say that’s inconsequential, but I disagree. It says more about me, doesn’t it? I also care what people think of me – correction, I care what my friends think of me. Do they see some shell of a person who has none of her own convictions or opinions? Do they see or hear my husband’s voice when I speak? What are they saying to other people about me? Why do I care? This certainly is not the person I want to spend the rest of my life around. I am better than that. I am stronger than that. It’s time to start working on it. Great post, as always. Judging is a hard habit to break. I can’t help but wonder – do people who judge others less also worry less about how others judge them? Thanks! And yes, I imagine that you would worry less about what other people thought if you weren’t doing the judging yourself. Eeee, that’s a tough one! I’d like to think I’m the type of person I’d like to be around for ever, but I also know that I can be a bit of a pain. I like to think of it as “medium maintenance”. I don’t freak out over everything and expect to be waited on, but I also don’t take any crap and have high expectations for people. I like to think that I am kind and giving, but I can also be selfish with my time because of personal goals (ie. school, running, personal space etc). I kinda get all introspective-y like this every 3-6 months or so and hold up a mirror and revisit my personal identity and how I conduct myself in society. I get a little self-conscious and awkward during these periods, but it is interesting to “check in” with myself once in a while. That’s so awesome, Lisa. Thanks for posting! This is a great question for us to ask ourselves on a regular basis, to check in to see if we are being who we want to be, to re-balance and re-calibrate. Wonderful blog, thanks for introducing yourself! Very thought provoking. Certainly something for me to think about and work on. Great post. I agree – it is hard to stop judging – but after doing so you never feel good about yourself. I guess we are all a work in progress.